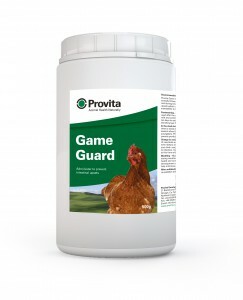 Provita Gameguard has been developed for game birds and contains EU approved probiotic bacteria in a powder. These bacteria are able to survive and grow in the intestine and colonise the surface of the gut wall and can aid in the digestion and absorption of nutrients resulting in an improved condition of gamebirds. Gameguard should be used after hatching and at times of stress to prevent intestinal upsets. It is economical to use and prices start from 8p per application (5kg x 5000 applications).